IN PROGRESS Here are select projects that are In Progress at the construction site or in our design studio. Included are many houses that the owner is involved in the construction. Owner -Builder homes are an important aspect of a sustainable lifestyle, and we enjoy sharing our knowledge of construction methods and materials that match their needs and skills, while helping owners understand the process and realities of being more in charge of the construction of their new environment. HIGH COUNTRY RANCH This owner-assisted-built home on a 500 acre ranch in the high plateau of eastern Oregon near the tiny community of Flora, is constructed of infilled strawbale walls, a dug in basement built of Faswall, and deep insulation filled roof trusses. After a number of summers living in their yurt while tending their pigs, yaks and garlic, this camera designer and author couple is completing their dream of living a rural off grid life. This 2000 sqf solar electric house has 3 bedroom spaces – 2 used as work spaces – 1-1/2 composting toilet baths, sun room for starting plants, and a sun-filled great room with an expansive Western view porch. The interior strawbale walls are finished in mud plaster and the floors are mud slabs over wood framing and some finished in hardwood. Strawbale, mud walls and floors, and cement plaster exterior was completed with the help of their son and his friends during summers at the ranch. HARMONY FAMILY LODGE A Cabin of 2400 sqf on leased National Forest land at Priest Lake Idaho for an extended family’s vacations. 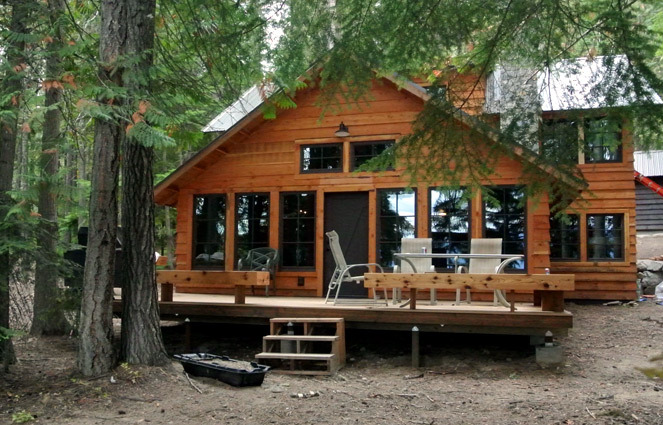 This Lakeside cabin consists of 5 bedrooms, 2 baths and a bunk room, and sleeps over 14 people. The cabin was designed to meet the detailed Forest Service size and exterior design criteria, site criteria, and the various occupancy uses of the family. The family hired a contractor for the shell construction, as the family is completing the remainder while vacationing at the lake. 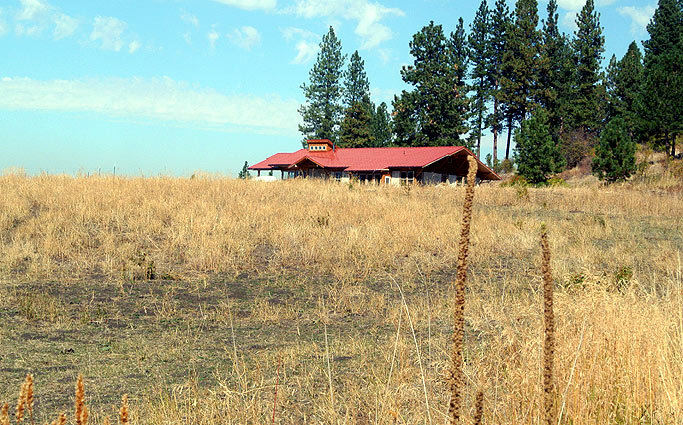 MOUNTAIN HOME Owner-built infill strawbale house in the mountains west of Chewelah Washington. This under 2000 sf (1580sf interior), 2 bedroom, 2 bath house with a large loft is designed to let the southern sun in while opening to the Western valley view with a large living porch that protects the windows from the summer sun. Photos show the framing ready to accept the strawbales in the walls. 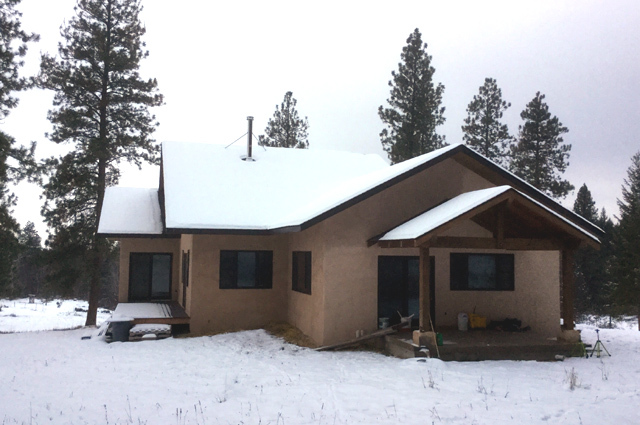 MONTANA GABLE Owner-assisted-built home on rural family land in western Montana has walls built of the Faswall ICF system and pre-engineered wood trusses. The design based on the McBirney Residence, adds 2 bedrooms and kids tv room on a new lower level that is dug into the sloping site. The main level plan changed the original design bedroom to a master suite sitting room. The owner has moved from Seattle raising his kids with his family and the wildlife environs of Montana. TOY BARN A simple western-style high roof pitch simple barn is designed with large overhangs to keep kayaks and country toys dry and accessible. The main level is an open garage plan housing a farm tractor, plows and other rural toys. 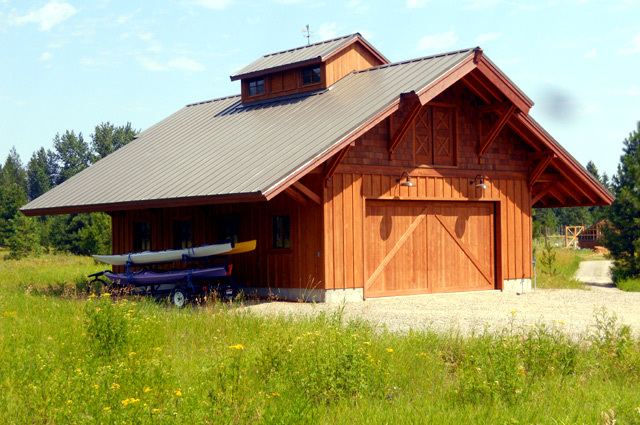 The attic roof truss design adds a 10 ft wide full length storage loft to the barn. The Loft stairs could be enclosed and windows added and converted into a guest house, small ADU or artist studio in the future. Project is now completed and full of the Owners toys. SMALL YURT ADDITION This small and simple bath addition to a 20ft diameter yurt, completes a local environmentalist dream of living in a small low energy house (400sf) on the edge of Sandpoint, Idaho. 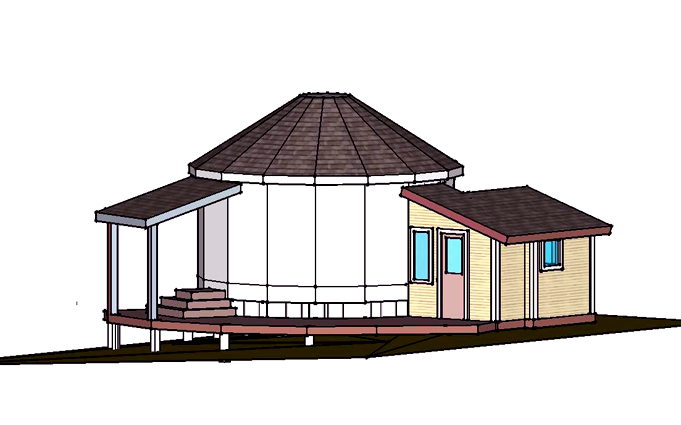 The 135sf addition connects to the yurt structure without changing the yurts shape by mimicking the yurts entry porch. 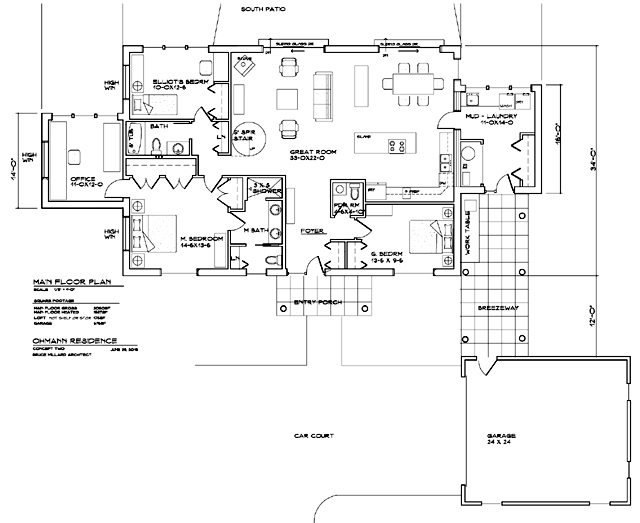 OHMANN RESIDENCE 2000sf solar orientated plan of 3 bedrooms, 2-1/2 baths with office off master bedroom, loft, and laundry-mud room. A breezeway connects the house to the garage while providing a covered outdoor work space. Construction for Selle Valley house north of Sandpoint is planned for summer 2016.